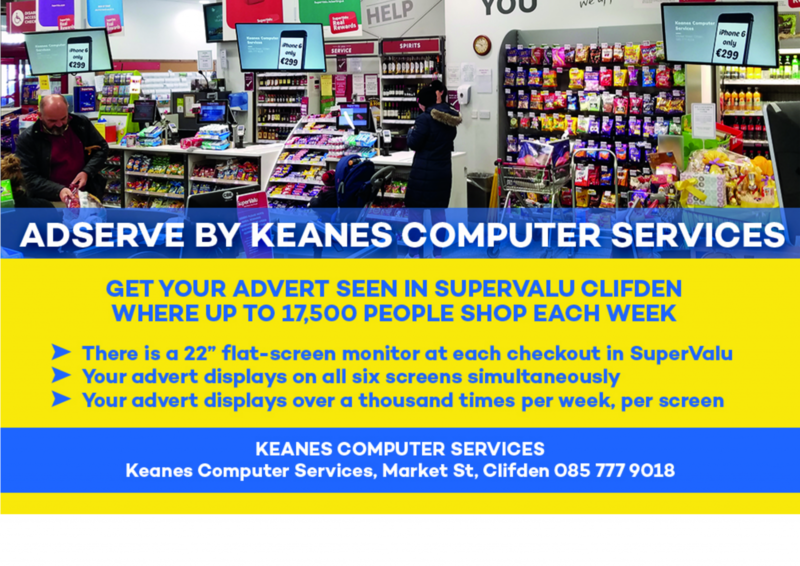 Get your advert seen in SuperValu Clifden, where up to 17,500 people shop each week. There is a 22” flat-screen monitor at each of the checkouts in SuperValu Clifden. Each digital advert displays for 15 seconds each time. Adverts play on a maximum six-minute loop. Your advert displays on all screens simultaneously, for 15 seconds, every six minutes at minimum. Your advert displays a minimum of ten times per hour, 130 times per day, and 910 times per week, per screen. This totals a minimum of 5,460 times per week. We can change your advert as often as you wish, upon request. You can supply your own adverts or we can design additional designs at €35 per advert, plus VAT). Prices start at €10 per week.